At Best Buy Homes, we understand that the kitchen is the heart of every home. In the past years, kitchens have also become the show pieces of many people’s home. It’s where we entertain, welcome family and friends, and help the kids with their homework. It is truly where everyone wants to be. 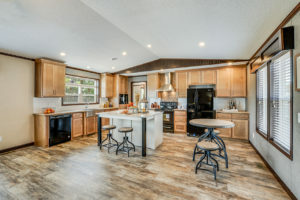 Open concept kitchens are more popular than ever, allowing the host (also known as the chef) interact with the people around them without missing any of the action. We have a few favourite kitchen features that have the biggest wow factors. Some of our models have a side hutch built right in. This custom design look allows for a ton of extra storage as well as versatile space. This style often includes room for a chair and an electrical outlet for a computer, making it a great choice for a desk. The counter can be used to serve food buffet style or treated like a bar with storage for glassware. A great option for those who like to entertain larger groups. Islands have become a very popular kitchen feature. In most cases, the bigger the better is the way to go in your space. A great kitchen allows to multiply your cooking prep space. Some of the islands we offer also include a cooking surface with a range hood overtop or a large sink. You also have the power to choose the island counter top that you like best. 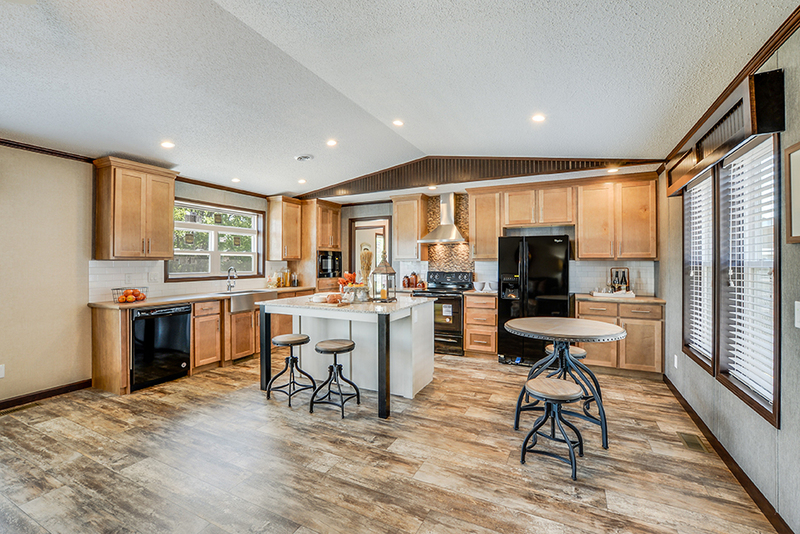 Islands are a great place for guests to pull up a stool to interact while you prepare dinner. A must have in a great kitchen! Wall ovens help to make anyone think you know your way around a kitchen. Often wall ovens come with two sections, allowing you to cook different items at different temperatures. The built in style fits in seamlessly with the cabinets around it and allows you to have a separate cooktop range. Walk in pantries are a great addition to an impressive kitchen. A perfect place to store your food and small appliances, a walk in pantry give you much more room than cupboards. If your goal is to achieve gourmet chef status, you’ll need lots of room to store your ingredients and gadgets! No matter what is important to you, we have kitchen options for you. From entry level to homes designed around the kitchen, we offer choice. Contact us to pick your kitchen and be cooking in no time!